Prominent conductor of opera and symphonic music in the twentieth century. (December 19, 1888 – November 15, 1963). Reiner was born in Budapest, Hungary to a secular Jewish family that resided in the Pest area of the city. After preliminary studies in law at his father’s urging, Reiner pursued the study of piano, piano pedagogy, and composition at the Franz Liszt Academy. During his last two years there his piano teacher was the young Béla Bartók. He worked at opera houses in Budapest and Dresden, where he worked closely with Richard Strauss. He moved to the United States in 1922 to take the post of Principal Conductor of the Cincinnati Symphony Orchestra. 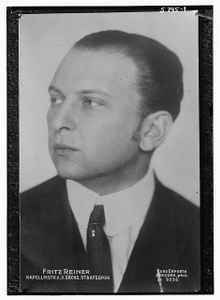 He remained until 1931, having become a naturalized citizen in 1928, leaving to teach at the Curtis Institute in Philadelphia, where his pupils included Leonard Bernstein and Lukas Foss. He conducted The Pittsburgh Symphony Orchestra from 1938 to 1948 and made a few recordings with them for Columbia Records. He then spent several years at The Metropolitan Opera, where he conducted a historic production of Strauss's Salome in 1949, and the American premiere of Igor Stravinsky's The Rake's Progress in 1951. Reiner's focus had been on American music since his arrival in Cincinnati, but after the WWII he began increasing his European activity. When he became music director of The Chicago Symphony Orchestra in 1953 he had a completely international reputation. By common consent, the ten years that he spent in Chicago mark the pinnacle of his career, and are best-remembered today through the many recordings he made in Chicago's Orchestra Hall for RCA Victor from 1954 to 1963.